In today’s post we head off to Miyajima Island, an island that is only around an hour’s journey from Hiroshima. You may have heard of Miyajima for it’s famous floating torii gate, which is listed as one of the top three sights in all of Japan! We travelled to Miyajima via a combo of tram, train and ferry! As long as you can make it to the coast, you’re set! The ferry runs very often, as is covered by a JR Pass if you have one, if not it’s not an expensive journey. Contrast the above two pictures, the mainland first, and Miyajima itself second. Both mountainous, both green, but one is significantly more built up than the other! That is part of the beauty of Miyajima, it feels so untouched despite being one of the premier tourist spots in the country. Crowds swarm the torii gate, which is only accessible whilst the tide is out. As soon as you leave the boat in your dust, you end up in a rather open area, which leads directly into shops which run along the coast. Miyajima is very easy to get around, you pretty much walk off the boat and follow the coast around, you’ll hit the gate and famous shrine in no time. However, things do get a little bit more complicated when you’re travelling in land, but never fear, everything is clearly signposted in English. The island is full of deer, we were supposed to avoid them due to them being in heat, however I may have sneakily befriended one, as you’ll see in a later post. I did see a woman’s trousers get bitten by one particularly angry deer, so maybe play it chill when going near the animals. This orange vanilla swirl tasted incredible, I’m hungry just thinking about it. Miyajima is partly famous for oranges grown on the island, so you’ll find lots of orange themed snacks and souvenirs. Now for both in one shot! I’m not sure exactly what these people were searching for in the puddles, it must have been something worthwhile, as a lot of people were crouched in the sand! The torii itself belongs to Itsukushima Shrine, which also is settled over the water. We’ll cover the shrine itself in a later post, as I took a ton of photos in there. The shrine, and torii, date back hundreds of years, all the way to the 1100’s. It’s much bigger upclose than you expect, just look at how tiny everybody looks stood next to it. I imagine the gate requires some intense upkeep to deal with the water every single day. The reds were not as vibrant as they could have been, but that only makes sense considering. Coins are embedded into the sand from those who have thrown them wishing for luck or otherwise. I wanted to prove that I could jump over this. I did it. I am proud of myself. Although I pulled this face. If you suffer from some trypophobia is called but you might wanna scroll past this picture extremely quickly. Itsukushima Shrine in the not-so-far distance. Everyone loves to walk underneath it, I did too, something about it feels so forbidden and strange! Also beware that the sand is soaking at all times, and your feet are probably gonna get wet. I wore mesh trainers as I do most days, and my feet were damn cold. Not least because I kept jumping across the stream at it’s widest points. Towering over the visitors and the mainland. And that was our trip to the torii gate! Now we head inland for the second of these posts! One final look at the torii gate! 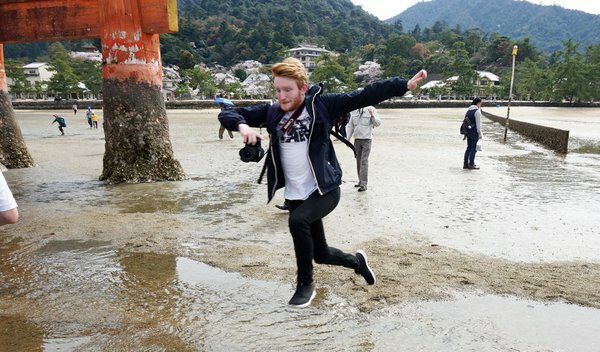 You can’t come to Miyajima and not see it, if you did I’d more shocked as to how you managed to spend time on the island without encountering it!